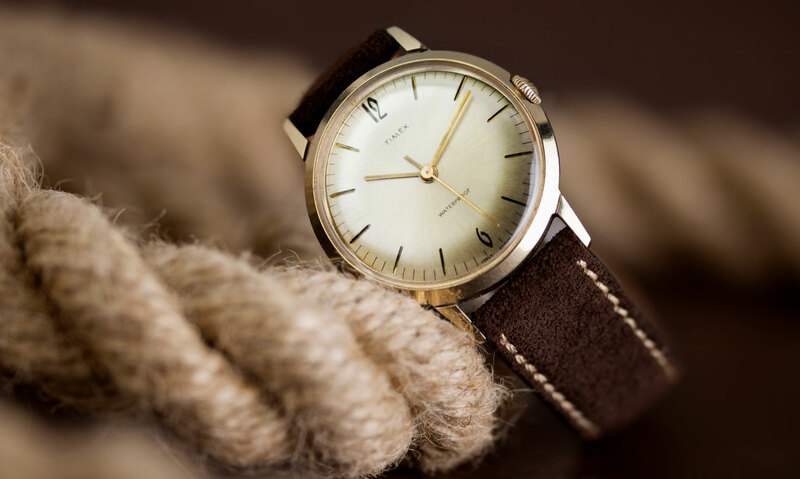 The Timex Marlin was announced late last year with a lot of online publications and press surrounding it. For us here in the UK, there didn't seem to be as much as a demand for the watch as in the USA where the watch was regularly out of stock with resulted in customers starting buying up models listed on eBay for over double the retail price. But before we jump right into this, a lightning quick 2-minute history lesson. Timex is a brand which is so well known across the globe, whether you were around to remember the first Marlin, you experienced the quartz crisis boom or you were rocking a Timex Calculator watch in the 80s, chances are you most likely have some past experience with Timex. Unsurprisingly, It comes as no shock to hear that Timex has lived a long life which started off with them originally producing clocks with Brass in 1854. Trading under The Waterbury Clock Company, the company's philosophy is still common practice today for mainly popular and up and coming brands, 'Bringing the price of high-end luxury designs down to manageable prices for the American consumer'. Fast forward to 1887 and after much success with such products, the company became known as Ingersoll Watch Company. Robert and Charles Ingersoll went on to create the Ingersoll Dollar Watch which was 'a handful of value for a pinch of the cost' and ending up selling millions. Ingersoll then went on to provide military watches during the Great War after some quick thinking from Ingersoll to modify their Midget pocket watch and have a contribution to the revolution of watchmaking as we know it. A final helping hand from Disney and no other than Mickey Mouse in the 1930's helped not only America during post-great depression but the Ingersoll Mickey Mouse Pocket Watch was born and quite possibly saved the company with its extensive success. 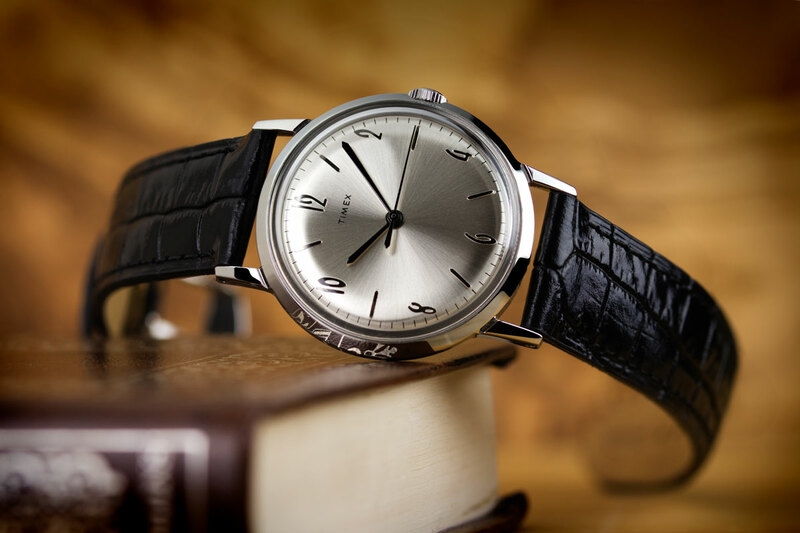 In the 1950's Timex became Timex as we know it today. The brand focused on reliability, superior design, durability and of course, value for money. Timex struggled to fit into the 'normal' way of selling watches due to only wanting a 30% mark up on their watches. Up stepped Robert Mohr, who worked hard to stock Timex models in many stores across the globe where you wouldn't commonly see watches for sale. 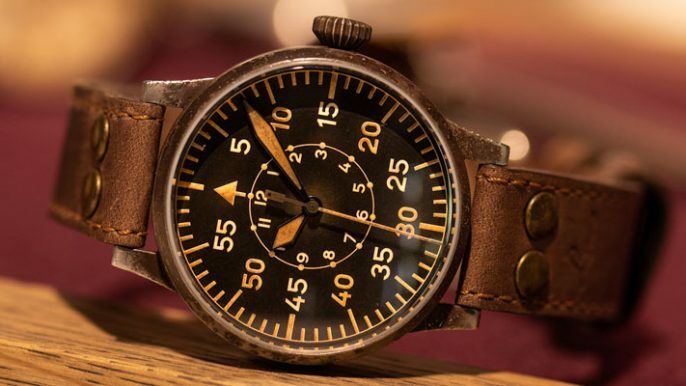 Just 10 years later, sales were reaching in excess of $70 million and Timex were seeing enormous success. It seems then that Timex are amongst the few who originally 'cut out the middle man'. The Dolphin Test - Vintage Timex TV Advert on YouTube - Check out this old school advert featuring John Cameron Swayze and a skilled dolphin! Timex's history doesn't stop there, and continues well into the digital age. When the quartz crisis hit, Timex adjusted well to this new age of watchmaking and capitalized on it. The new adjustment of using battery powered watches became the norm for Timex even up to present day where the still make affordable, quartz models and see huge success worldwide. It's clear that over the years they experienced many peaks and troughs, but one thing always stayed the same. They always aimed to provide well-made watches at an affordable price for everyone. This now brings us nicely back to the topic at hand. 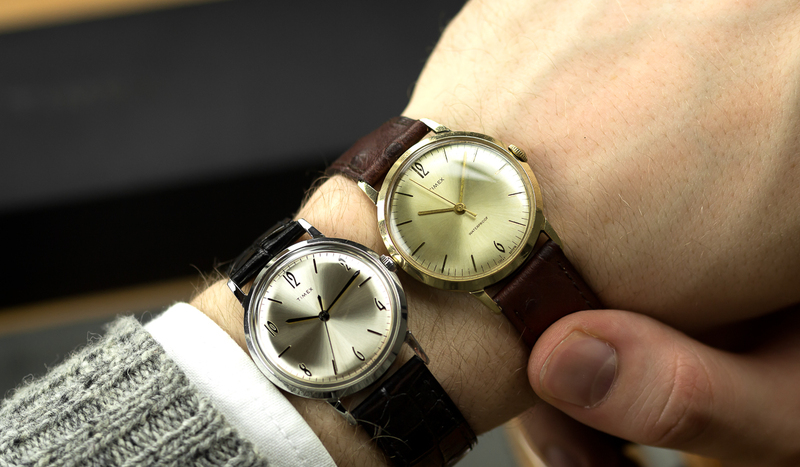 How does Timex's latest model, the Marlin re-issue compare to it's old Grandad, the original? Both feature pretty much identical case design, they come with sunburst dials, both crowns are hidden by the case and manual wind movements can be found in each model (oh, and they are extremely thin). 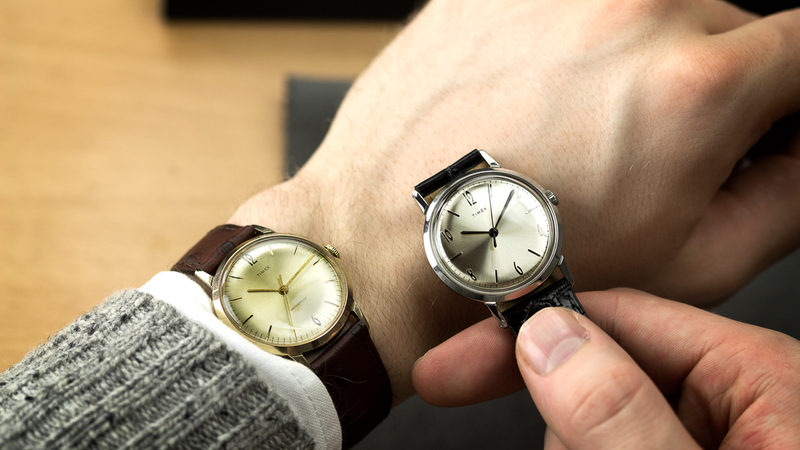 A lot of these similarities result in two watches which wear very similar on the wrist. The original model I've been wearing actually has a case width closer to 36mm vs the re-issue 34mm and also has the old school 'Waterproof' text on the dial (an addition Timex had to drop from the new re-issue due to a change in laws around calling a watch 'waterproof' over 'water resistant'). 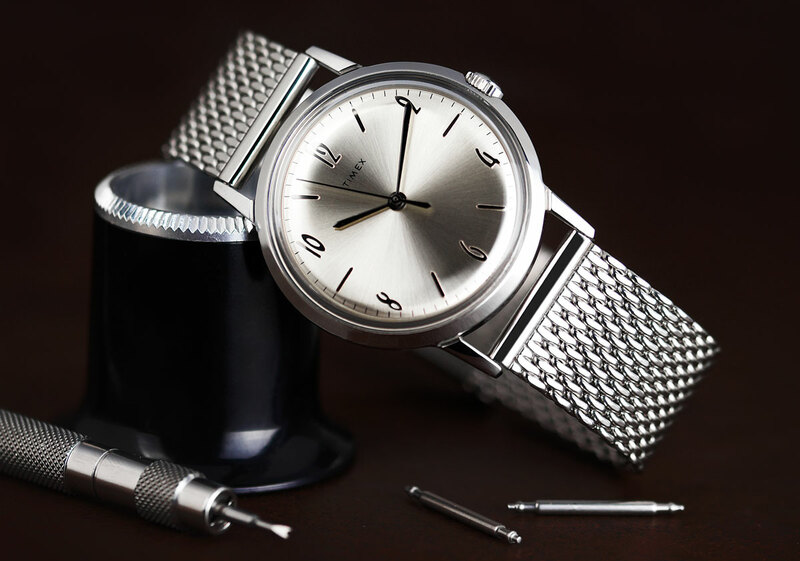 I am, like most people drawn to the slightly larger case size of the original as most of us modern horology fans are more familiar with a larger case. After a week experiencing the original, I found myself pleasantly surprised with the little manual wind movement that powers it. 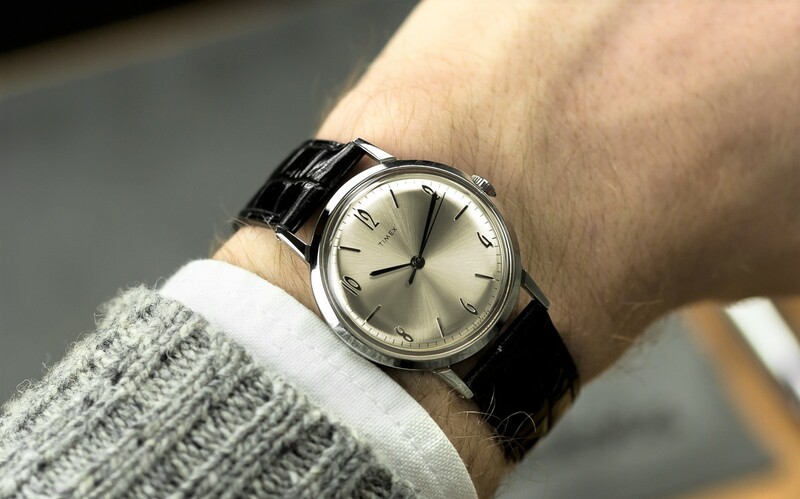 For a watch which is 50-60 years old, the movement seemed to be working with no major dramas. On many vintage watches, unscrewing the crown can be a tense moment, hoping nothing disastrous doesn't happen. After 7 full days on the wrist, I can confirm I have full confidence in the movement when winding it and changing the time. When it came to straps, the original suits most of the re-issue ones suggested here. I enjoyed wearing it on one of our Suede Contoured Italian straps recently added to the site, especially as the strap gradually got better the more I worn it. Summing up the original, I'm surprisingly impressed. The slightly larger size is much appreciated on my 7 1/4 inch wrist, I only experienced issues with the power reserve regarding the movement, which is to be expected on a watch three times the age of me! Overall for a watch costing less than £50, it's very hard to go wrong with such a timeless looking watch. Comparing the original to the re-issue, it's quite a straightforward story. When a watch is released as a re-issue most companies change a few specific details to try and fit into the current watch market. Timex didn't do this at all, this may have been helped by what seems like a shifting market back towards smaller case sizes, but they stuck with the good old saying 'if it's not broke, don't fix it'. Based on the popularity of this model in recent months, it's fair to say that was a good move by Timex. The main points of interest and things I enjoyed about the re-issue are as follows. The silver dial on the re-issue gives off a slight cream colour under certain light which is highlighted even more with the deep black hands and indices. Much like the original, the movement is reliable as ever. For a dress watch, you don't need anything more than a simple 3 hand movement made even more useful with it being a manual wind movement, perfect for topping up when on the wrist. I've talked a lot about the re-issue being very similar to the original and also similar Timex models from the same age. The crystal, dial, case, movement, hands and indices are the ultimate definition of 're-issue'. Many re-issues from companies include some subtle upgrades for the modern day wrist. Sapphire crystal over acrylic, a matt finish ceramic bezel, movement improvements etc. However, I believe paying £175 for an old-school timepiece when original examples exist on eBay for less than £50 seems odd. I feel to an extent that if Timex included some upgrades rather than a direct re-issue then the price would seem more reasonable. Don't take this as I don't like the re-issue, I think it's a brilliant watch, especially for its mass market appeal, the huge success its experienced and the fact Timex kept the case size the same as the original will hopefully act as valuable evidence for more of our favourite brands to continue to release re-issues and historically inspired modes that are accurately portraying the original without worrying about popularity and commercial success. 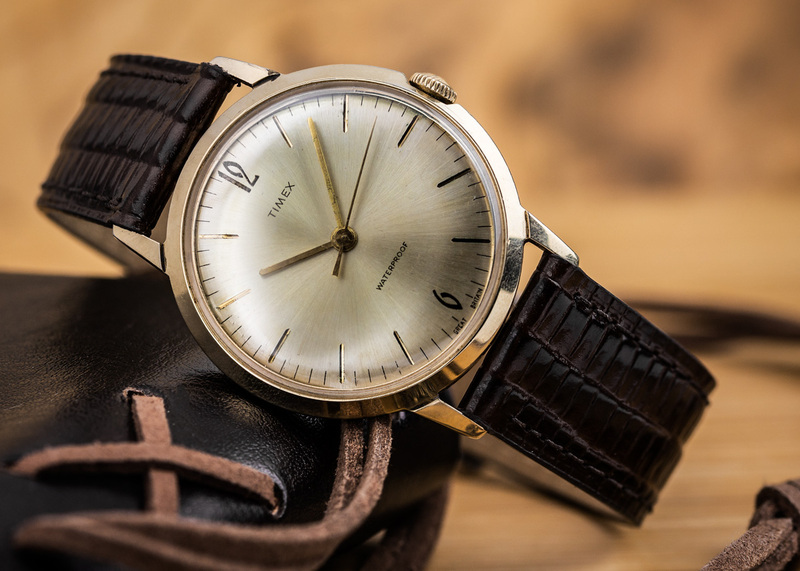 What I do believe this shows is not that Timex has overpriced the Marlin at all, but more it highlights how strong the current state of the vintage watch market is and the fantastic purchases that are out there. "Still Ticking" - Vintage Timex TV advert on YouTube - featuring the original Timex Marlin in vintage advert that needs to be seen to be believed! Great review on comparing the two watches! 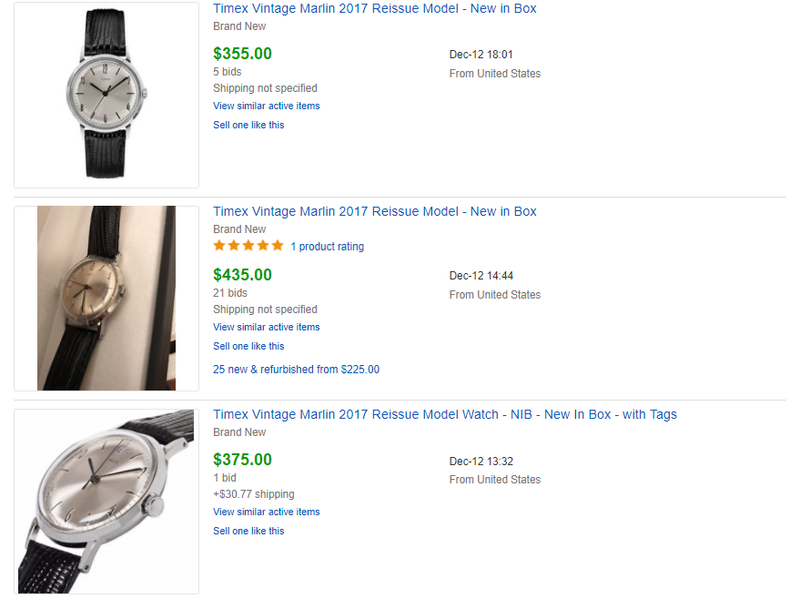 Do you know any other websites I might be able to find the same model as your old timex marlin other than ebay? Great to hear you enjoyed the review. There are many auction websites you could look at. 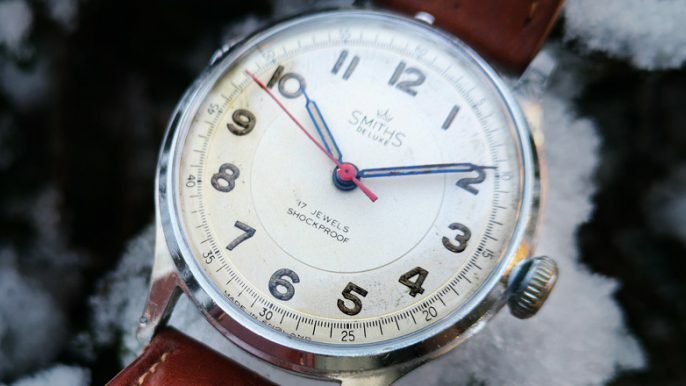 Buying vintage watches online can always be risky as you can never be 100% sure what you're buying, this is even more so with auctions. 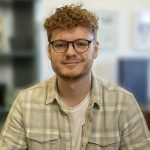 A good alternative site to eBay I've found myself searching on recently is Etsy. 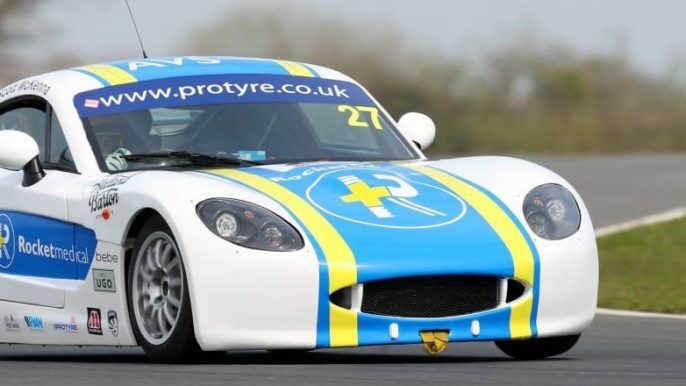 A very similar set up to eBay so that would be worth having a look at. Where'd you get the alligator strap in the first picture? Very nice review especially because you took the time to compare the "OG" ond the newbe. I was wondering. That Brown suede strap. is it directly from the shop because maybe I'm blind but i couldn't find it. Would you be so kind and provide me a Link to it? Thanks for your comment, glad you enjoyed the review! I have had mine since about christmas (the 2017 model) and am wearing it now. I like the size and also have the Rado Captain Cook (37MM) the size it think is fine and it is a fun little watch. Was lucky enough to get it from timex.com.